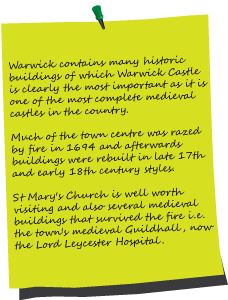 The canal takes a circuitous route avoiding Warwick’s delights. What you do get to see are the extensive moorings of Delta Marine Services and Kate Boats, although you have to cross to the other side at bridge 49 to enjoy an ice cream at the latter. A suburban landscape follows, not hideous but hardly inspiring up to Lock 24 and Lock 25 next to the Cape of Good Hope renowned as a proper pub with good food and wide choice of ales. Nothing of note now happens until you reach Bugbrooke Junction and the start of the Warwick and Birmingham Canal. To the left the Saltisford Arm goes to Warwick, the Saltisford Gas Works and the original canal terminus. You reach Lock 26 under a large road bridge and there is a real feel that you have left the town behind as you move onto further locks until confronted by the impressive sight of the Hatton flight, ‘The Stairway to Heaven’. A thousand men were engaged on the 1930s widening work using new concrete technology, the locks are now a low key tourist trap where a cup of tea can be obtained at a small café or something stronger at the Hatton Arms. After Hatton Top Lock there is a pleasant cutting with moorings and, once the last day tripper is left behind, everything becomes quiet and rural. Approaching Hatton Station you realise that the Chiltern Railways line has been in close attendance for a while and you pass the moorings of the Mid-Warwickshire Yacht Club. I don’t know what qualifies as a yacht but, for a location that is so far from the sea or open water, a club for them seems a bit odd. After bridge 57 until Shrewley Tunnel the countryside goes from fairly rural to very pastoral even though the railway runs parallel and the M40 isn’t too far away. Shrewley Tunnel is 433 yards long and, due to no towpath, the walker has to go over the top of the hill, cross the village high street or in Shrewley’s case its only street, and then plunge down a dark and dingy horse tunnel to the north portal. The canal leaves the railway and motorway for a while, hugging the side of the hill. There are few people about and, looking around, you are struck by the anomalistic adjoining Christmas tree plantations in the middle of the Midlands. An embankment furnishes outstanding views and it is not until emerging from a cutting (one of the projected tunnels) after bridge 62 that traffic noise again becomes apparent. The number of people you pass increases towards Tom o’ the Wood moorings, the eponymous pub (which looks good and usually receives decent reviews) and a goat farm. When the canal straightens, goes under a line of pylons and bumps into the railway, you reach Kingswood Junction where the Stratford-upon-Avon Canal leaves for Shakespeare country. The canal straightens after bridge 65 through fairly non-descript fields. The towpath is narrow, muddy after rain, and the browny green water is full and wide. A few boats cluster at the Rising Lane moorings at bridge 66, then the canal bends, the path narrows and is cut up by mountain bikes. The countryside is unspectacular, no grand vistas, just small fields, horses and always the sound of something going on, a circular saw, a tractor, even guns going off. The landscape remains similar up to the Black Buoy moorings and Cruising Club next to the Black Boy pub which has well looked after and extensive gardens. Not too far away straddling the King's Arms Bridge there’s the King's Arms offering accommodation and canalside dining but this is another pub that, from their website, doesn't appear to sell any beer. On the towpath side of the canal a happy hour can be spent visiting an animal sanctuary. The hawthorn hedges that edge the canal are now shorter and you can see more of the landscape especially when the canal is elevated as it swings towards Knowle long term moorings and locks. Originally six locks until the 1930s, this is now a flight of five locks lifting the canal about 42ft (see Knowle to Bordesley page for photograph). Stephen Goldsbrough’s old boatyard follows the Top Lock at Knowle Hall Wharf and a sign tells us there’s only 13 miles to Gas Street. Anglers, all middle aged and male, then take charge of the towpath tossing in maggots and staring grimly. To lighten the atmosphere there is a ludicrously painted lemon house near bridge 72. The fishermen remain and you sometimes have to clamber over rods and other equipment to make any headway. They actually seem a cheery bunch when detached from their bait boxes. All kinds of animals from hamsters to monkeys in a sanctuary that even had, the last time I visited several years ago, a rescued ex-circus tiger. The Black Boy in question is reckoned to be dark skinned King Charles II. The pub was originally closer to the road and moved location in 1793 to take advantage of the canal trade. . Originally three tunnels were planned along the canal’s 22 miles but the other two became deep cuttings. This pub used to be a favourite of motorcyclists, but since a name change (the pub used to be called the Waterman) I don’t know whether Barry Sheene adherents still compare the size of their pistons in the car park on a Wednesday night . With the Earl of Warwick backing the project the Act of Parliament allowing the Warwick and Birmingham Canal was passed in March 1793. It would stretch from Digbeth on the Birmingham Canal for 22 miles to Warwick. 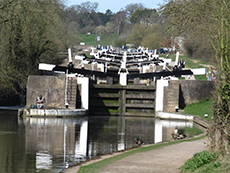 Both it and the Warwick and Napton Canal were opened on 19 December 1799 and traffic began on 19 March, 1800. Over the last 25 years a charitable trust has had success in its regeneration and moorings are available very close to the town centre.